In this age, the ability to make strong digital images of your work is second only to the ability to make strong work. You could make the best pots on earth, but if you don’t know how to photograph them, few people will ever know it. At the very least, a photograph should accurately represent your view of your work. Every artist sees their work through the eyes of a creator, a much more critical and intimate perception of the object than the general public is likely to have. Shooting your own work is an opportunity to show the viewer what you see as the most important qualities of your art. To this end, I am constantly working on refining my photo setup. Today, I will be sharing the process and equipment that I currently use to show how my physical objects are translated to digital imagery. When is a piece finished? Some say once it is out of the kiln, some consider it to be finished once it is in it’s final context (purchased and being used by someone). To me, the process is complete once the images are taken of it. At that point, It is ready for market, and I have documentation of it, to refer to later or to use for slide presentations, etc. It has served its purpose to me, and is ready to go out and serve a new purpose to someone else. That means that every single piece I make gets photographed from at least 5 angles. I do not have a fancy photo studio or anything like that. 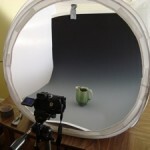 All of my photography takes place on a minimal setup, right on my kitchen table. 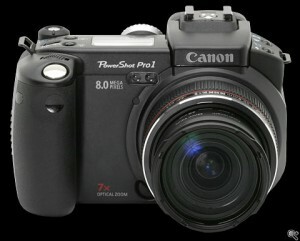 I use a Canon Powershot Pro1. Why this camera? Because my previous camera, a Nikon Coolpix 8700, was stolen out of the trunk of my car, and my father was generous enough to give me and extended loan of his camera. Both of these cameras are great for my needs and fit into the “prosumer category”, the gray area between point-and-shoot and digital SLR. The main feature that I would call vital to the studio setting is Manual White Balance, more on that later. Additionally, the ability to set the aperture, to adjust the focus depth of field can come in handy for dramatic shots. I think you can make any camera give good images as long as you are willing to do a bit of trial and error with it. As you can see, I use a fairly simple setup for lighting. The lights themselves are Eiko 250 watt, 3200 Kelvin bulbs that I put into the cheapest possible hardware store clamp lamp. These are clamped to the backs of two dining chairs, and pulled about 4 feet away from the table. I find that a 45 degree angle upwards gives a nice soft light. It is worth spending some time playing around with the position of these lights to get the best possible results for your own work. To difuse the light, I use a 36 inch EZcube (actually, it is a cheap knockoff from eBay) This is nice because it is totally portable, and compacts into something the size of a frisbee in just seconds. My entire setup can easily fit in one medium plastic tote. This tent-like structure is made of light diffusing nylon, allowing for soft, even lighting from any angle. It originally had a front flap, which now I wish I hadn’t thrown away. You can find these for as little as $50. and they are worth every penny. They do, however, impose a scale limitation. I cannot shoot anything bigger than 1 foot in any direction. Lucky for me, my work is all smaller than that. If yours is not, this might not be the best guide for you. The really expensive part of my setup would be the grayscale vinyl backdrop. I get my Varitone 928 Background at here. These get scratches and nicks, and become useless after about 100 pots are shot, even being really careful. These are really great for this setup because they are perfect neutral gray, allowing me to set my White Balance to them, and they sort of fake a depth to the photograph. The gradation is so fine that you cannot see and marks of printing at all. It is a seamless, smooth, matte transition from gray to black. This is simply hung in place with some duct tape. The stack of books helps elevate the pot so it does not wrinkle or crease the backdrop against the curves of the EZcube. Once all of this is in place, the lights are turned on. All other sources of light in the house are turned off. This is important. If you shoot during the daytime, you will need daylight balanced bulbs, and still must turn off all other light sources. If you do not, the photos will have very distracting and inaccurate coloring. Once this is done, it is time for some White Balancing. This is probably the most widely occurring problem in art photography. 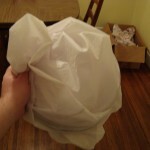 If you are into Etsy, this is the main factor separating the front page worthy photos from the non. It is a simple step not known by many. Once the setting is exactly as it will be in the photos, the lights placed where you want them, all other lights turned off, aim your camera at the center of the backdrop. Zoom to fill the entire viewfinder with greyscale. Make sure there is not anything in the backdrop. 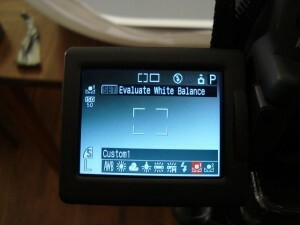 Find the camera’s manual white balance. Click “Set WB” and allow the camera to set itself for that particular lighting. Since the backdrop is neutral, it will automatically set up your camera to make stunningly accurate color for every shot. I have found that if I change the lighting arrangement, the reflection of the paint on the walls will alter the warmth of the light. Make sure to reset the WB every time you arrange the lights, and every time you do that, make sure the backdrop is empty. Thanks for stopping by and reading this. I will elaborate on some of these points further in future articles. Please leave your questions/comments. Thank you so much for this information. I just ordered a Powershot last night! I had also seen the cheaper cubes in a catalog and was wondering how big the inside was and if they worked well. You answered a lot of questions for me. Fantastic. White balancing will really help! First, I love your pottery. The leaf bowls, etc. are gorgeous–color, design. 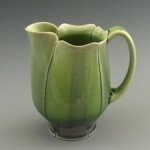 I’m starting a porcelain classand these were nice inspiration. Second, thank you for this wonderful photo tutorial. I’ve really been struggling with this and feel like you’ve simplified it so nicely. Thanks for your generosity with this information! As always, your info is tremendously helpful! I have a question… Do you use the flash off the camera for fill when you do this setup? 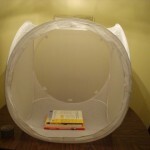 I got my new portable tent kit today and I was having a heck of time with no flash and LONG shutter times. I decided to finally just use the remote shutter control and that helped a lot. However… I noticed the color was slightly better when used with the flash. Just curious about what you did/do. Flash is a BAD idea if you ask me. It basically blasts the pot with a bunch of light from the front, flattening out everything, casting a shadow behind the pot. The whole point of a studio setup is to soften and control the light that hits the pot, so that you can capture the true character of it. If there is a problem with really long shutter times, try adjusting the aperature, or even use the exposure +- function. Or go buy more or stronger lights. this is super helpful and easy set up. thanks again! Thanks, this is really helpful information! Thanks so much for this info. 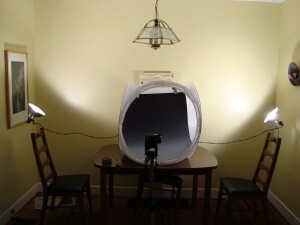 I have the setup and even the lights, but have not been setting my white balance to a neutral gray. I’m hoping this helps to fix the problems I’ve been having with some of my images. Photography is the bane of my existance, but this info shall set me free, er at least lengthen my leash! In researching the EZ Cube, I see they make a gradient background to fit inside of it. http://store.tabletopstudio-store.com/clacri.html Any reason why you didn’t use that instead of the Varitone paper? Have you tried other varitone papers? Jeff, this is nearly the exact set up I also use down to the same camera given to me by dear Dad. But I’ve been too lazy to read the manual and have been color correcting each photo in photoshop (not really a time saver). I am posting a link to this page on the FB group I’ve set up for my students- thanks for your clear explanation! Thanks so much for the advice on setting the white balance. I have been photographing my work for years without doing that, and although the photos are pretty good, sometimes the colors don’t ring true to the actual piece. 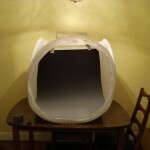 I tend to like to use natural light, so if this sparks anyones interest: build a little tent with white sheets in the yard and place the grey background inside it… you can also reflect a little sunlight from behind the camera with another sheet. The downside: the intensity of sunlight is always variable, so the photos will not have the uniformity that you can get with a controlled environment indoors. Happy potting! Hi Jeff, thank you for your generosity in sharing all of this! 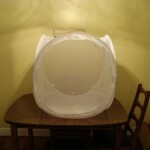 I’m inspired to revolutionise my photography set up now. I have a really dumb question though, with your 36″ cube do you buy the 31″ or 42″ variton background? I’m in the UK and I’d like to order one because it’s the best price I’ve seen but I don’t want to get wrong one.